Head of the Presidential Secretariat Dr Roger Luncheon says that persons interested in the specifications of works to be undertaken by the Government, other than those tendering for the projects, will still have to purchase the bid documents. Dr Luncheon was at the time speaking to journalists during his post-Cabinet press briefing yesterday. “Buying the bid document is a necessary aspect of the tendering process,” Dr Luncheon stressed, adding that he believes that those who might not want to tender but still want the specifications would spend some money to acquire the documents. Luncheon asserted that the possibility that the specifications would be provided free of cost would constitute a fatal blow for the tender board in recovering from the bidders the cost of reproducing the document. The Head of the Presidential Secretariat hinted that even with Access to Information legislation in place the information will not be provided free of cost. That Bill, he said, is currently in its draft form at the Attorney General’s Chambers and will be sent to a Special Select Committee when tabled in Parliament so that stakeholders can have an input. He insisted that the Bill will be tabled and enacted in 2011. The very secretive way in which the specifications of government contracts are made available has been described as a way to facilitate corruption according to some Members of Parliament and key figures in society. At present, the only persons privy to the information are those that buy the bid documents, and several efforts by this newspaper to obtain those specifications from contractors who have purchased those documents have proved futile. Some time ago President Bharrat Jagdeo had told a Kaieteur News reporter that this newspaper can buy the bid document if it wants the information, and can even tender for projects. 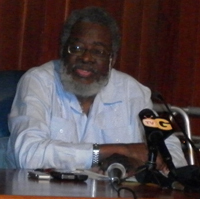 Member of Parliament Everall Franklin, whilst conceding that it is necessary for the contractors who bid for the contracts to purchase the documents given the printing and other costs attached to their preparation, said that the information should be made available online for the average person to access. He had noted that it is imperative for the nation to be au fait with the specifications of what a contractor is undertaking so that they can be able to properly monitor and ensure value for money. Franklin drew reference to a request that he had made in Parliament as it relates to the specification of the drying floors being built by the Ministry of Agriculture. He said that they could come up with a figure of how much it would cost, but the Ministry could always say that the figure they came up with did not conform to the specifications which they had required. “The reason for the document was so that we could properly cost the project,” Franklin explained. The MP insisted that just as the government makes available on a website the invitation for bids, it should also make available the specifications for each project. Leader of the Alliance For Change, Raphael Trotman, had said that for the information to be so difficult to obtain is an insult to the people of the nation. He questioned why it should be so difficult to access basic information, pointing to the urgent need for the Freedom of Information legislation. Trotman opined that such secretive dealings facilitate corruption to the highest level and has to be rooted out.